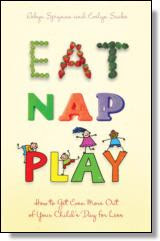 Lisa @ TLC Book Tours was kind enough to offer 1 copy of Eat Nap Play to one of my readers in a Giveaway. Here is my review for it. I loved it. If you are a parent or know a parent, this book is bursting with great ideas! * You must be a follower of my blog. * You must leave a comment. * You must reside in the U.S or Canada. One winner will be picked on Friday, April 23. Info will be sent to Lisa and book will be sent from publisher. I would love a copy! Looks like it could be lots of fun. I'm very interested in winning this one! I am a follower. Please count me in. am entering your giveaway (cross my fingers). this book looks really cute. love how its a play on liz gilbert's eat pray love! oh, and even without the giveaway, i'd have become a fan of your blog anyway! have a great weekend! I am a follower and this book looks great! I am always running out of ideas to entertain my son! This would be great. Thanks for this giveaway! Thanks everyone for signing up to win Eat Nap Play. Welcome new followers!! One more week to go. Spread the word to any other fellow bloggers who may be parents and would benefits from this book! Sounds like a book I need! Thanks for the giveaway. I'm a follower - this looks like a neat book! !